To make the salad, combine the green cabbage, red cabbage, carrot, celery, onion, cilantro, and peanuts in a large bowl. Toast the sesame seeds in a heavy skillet over high heat for about 2 minutes, stirring constantly, until they begin to pop and become fragrant.Cool, then grind them in a blender or food processor and add to the salad. To make the dressing, combine the vinegar, apple juice concentrate, soy sauce, ginger, garlic, and pepper in a small bowl. Just before serving, pour the dressing over the salad and toss until evenly distributed. This salad is best served immediately. 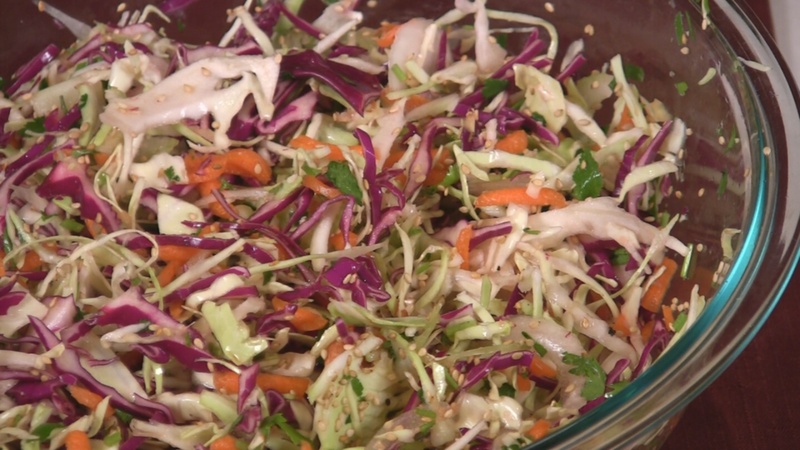 If you must make Asian Persuasion Coleslaw in advance, store the prepared vegetables in a covered container for up to 1 day and toss with the dressing just before serving. *For a gluten free version, replace the soy sauce with wheat-free tamari.